My special guest to wrap up the first month of 2017 is Rebecca Fitton. We're talking about her spiritual memoir, book of poems, Wave Rider: Poetic Journey from Abuse to Wholeness. Rebecca Pott Fitton explored different places and professional work. She grew up in Delaware and went to college in upstate New York. After graduating from Keuka College, she earned an M.A. in international relations at the University of Delaware. Then she headed to Michigan for careers in urban planning and health-care administration and an MBA from the University of Detroit. She continued working in health care in Ohio and retired as president of CareView Home Health in Middletown, Ohio. Retirement can be a busy time. Fitton brought her business acumen to service on five nonprofit boards. After her husband, Richard, died, she realized that the time had come to remake herself. As the lyrics of the song go, “I’d built a life wrapped so tight it was strangling me.” Freedom was a spirit call from Santa Fe, New Mexico. Welcome, Rebecca. Please tell us about your current release. 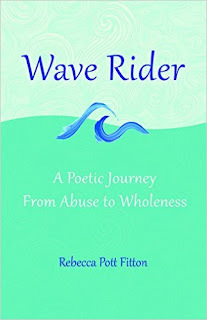 Wave Rider Poetic Journey from Abuse to Wholeness is a poetic reflection of my healing path from childhood sexual abuse, abandonment and neglect to wholeness of body, mind and spirit. This book tells the story of my hero’s journey. While I enlisted the guidance of many healers and teachers, I learned that only I could heal myself by uncovering my layers hidden in darkness. The first section in the book is named “Darkness” and reveals my struggles, demons, and despair. The second section “Between” captures the spiral process of my multi-dimensional healing. “Spaciousness” begins with my arrival in Santa Fe, New Mexico, a city which supports my spirit. The last section “Wave Rider” is my connection with the universe and the shifting paradigm that is movement toward the spirit of the divine feminine. Just as we seek balance of our individual masculine and feminine energies, so does the universe. I wrote the poems over a number of years without any intention of publishing. The poems would come to me in the middle of the night. About a year after most of the poems had been written, I decided that my work would not be complete unless I published. So I organized my poetry and found a publisher. I continue to write poetry but have not determined if the poems will become a book. Throughout my professional life, I always wrote clearly and succinctly. So I could write. I’m not sure that I consider myself a ‘writer’ even today. I have never written full time. I write whenever the poetry comes to me. Because I am retired, my days are very fluid and full of all of the life activities that require attention for my well-being, for my dog and for my home. Do not under-estimate your power. Thanks for being here today, Rebecca. During her virtual book tour, Alex will be awarding a $50 Amazon or Barnes and Noble (winner’s choice) gift card to a lucky randomly drawn winner. To be entered for a chance to win, use the form below. To increase your chances of winning, feel free to visit her other tour stops and enter there, too. Also: Stealing Magic will be $0.99 during the tour. Alex writes contemporary fantasy books for a middle grade audience and older. There are three (self-contained) stories in the Legacy of Androva series so far, with a fourth on the way. You can contact Alex, and find more information about Androva, including a character interview, at http://www.alexcvick.com. Alex lives in the South of England with her husband and two daughters. When she's not working, or writing about magic, she also loves reading and photography. Welcome, Alex. Please share a little bit about your current release. Stealing Magic is the first book in the Legacy of Androva series. It follows three main characters, Jax and Darius who are underage magicians from Androva, and Shannon who is an ordinary teenager from our world. They must try to understand and then prevent the terrible consequences that follow when an ancient treaty between their two worlds is broken. I love reading stories about magic. When I was younger I could never understand why I hadn’t encountered any magic myself! I found the idea of it so believable. It was probably inevitable that I would one day imagine a story that explained why magic was so hard to find. Stealing Magic began as a short story, which I wrote to settle an argument with my daughters. I was encouraging them to enter a 500-word story competition, and they were telling me that it was too difficult. Once I had written that first scene, it was impossible to stop. Jax and Darius, magic-takers from Androva, appeared through a forbidden portal, and as a result, Shannon might have become the first magician on our world for centuries... there were so many questions to answer about what happened next! This excerpt is the moment when Jax first realizes that Androva could be in danger, even though he doesn’t know about the treaty yet. He is being visited by Revus, his father, and Marcus, another member of the Androvan Council. Marcus looked around the room with a rather disdainful look on his face, pausing when he noticed the ceiling, and the colorful mists swirling there. Revus sighed. He knew Marcus was correct, but he still hoped that Jax would conform of his own accord without him having to impose the punishment that Marcus wanted. There was also the matter of the Harvest Quota. Jax was the single best magic-taker on Androva, and they could not afford to lose him, especially now. Jax was surprised. This was a significant confession for the Council to make. The Quota was part of Androvan life, always protected, always secure. “Of course,” he replied. “I will do whatever the Council requires.” Marcus stepped suddenly forwards, staring into Jax’s face with an intensity that would have made Jax move backwards, had he not already been seated with his shoulders against the window. 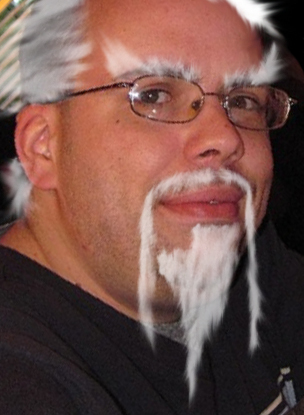 “You will indeed do whatever we require,” he said menacingly. “You will follow the rules of the Code, and you will accept the consequences if you do not.” Jax turned his gaze towards his father. I recently released the fourth book in the series, Controlling Magic. Like the other three books, it’s a self-contained story, as I can’t seem to stop writing on a cliffhanger! In the Androva/Terra universe, it’s been a year since the events of Stealing Magic, and the adventures haven’t stopped. The last story involved another world called Imbera, and I’m exploring the history of that a bit more in the fifth book. I’ve been describing myself as an aspiring writer since my school days. Even as I grew older, underneath the career history on my resume, I’ve always put writing as one of my interests! I don’t know when I’ll be ready to drop the ‘aspiring’ part, because I still have so much to learn. But I can’t wait to find out where my writing takes me next, and I know that I’ll never stop. Unfortunately I can’t write full-time, but thanks to a very supportive family, I manage to fit in quite a lot of writing around my day job. My writing timetable is irregular, because there are weekends when I don’t feel like writing at all, and other weekends when I do nothing but write. Sometimes I just have to take a vacation day in order to keep writing, because I’m so into the story that it would be almost painful to stop! It would all be much easier if I could plan my books, but I can’t seem to write that way. I don’t know exactly where the story is going to go until I sit down to write it, and I never know when or how it’s going to end until I get there. I like to give a reader of one of the previous books the chance to name a character in the upcoming book. I’ve done this with all of them so far, and I’m about to request contributions for the fifth book. Because Androva, and now Imbera, are quite different worlds, you can be very creative with the names, and they could be made up entirely! Also, I use brackets too much. (I could probably use them on every page if I didn’t stop myself!). Beta readers often point this out to me. I always wanted to write. I created stories in my head and on paper all the time. When I was growing up, my heroes were all authors. I thought it was like a superpower, being able to generate these amazing alternate realities out of only words. Even though I ended up with much more of a business career, I didn’t stop dreaming about one day writing a book. I was never brave enough to try it though. When I had the idea for Stealing Magic, I just had to start writing. I don’t know why it was different this time, but I’m incredibly grateful. I want to say a big thank you to everyone who has read my books. I love to hear from readers, and I also love answering questions about the stories and characters, so please let me know if you have any! Thank you so much Lisa, I really enjoyed answering your questions! Writer Leo Adam Biga joins me today to chat about his film & entertainment book, Alexander Payne: His Journey in Film. Author-journalist-blogger Leo Adam Biga resides in his hometown of Omaha, Nebraska. His articles appear in various newspapers and magazines as well as on his popular blog, leoadambiga.com, and Facebook page, My Inside Stories. His work has been recognized by his peers at the local, regional and national levels. He was the 2015 recipient of the Andy Award for international journalism from his alma mater, the University of Nebraska at Omaha. That grant supported his reporting mission to Uganda and Rwanda, Africa in the company of professional world boxing Terence Crawford of Omaha and Pipeline Worldwide director Jamie Nollette. Biga is the author of several books, including Alexander Payne: His Journey in Film and Crossing Bridges: A Priest's Uplifting Life Among the Downtrodden. Biga's reporting and writing about Payne has made him a recognized expert on the Oscar-winning filmmaker (Sideways, Nebraska) from Omaha. His latest book is Nebraska Methodist College at 125: Scaling New Heights – a history of the Omaha-base college of nursing and allied health celebrating 125th years. The writer is developing the Nebraska Screen Heritage Project as a multimedia celebration of native Nebraskans in the film and television industry. He is also developing a book about Omaha's Black Sports Legends. Welcome, Leo. Please tell us about your current release. Articles and essays take you deep inside Alexander Payne’s creative process. This second edition includes significant new material related to his last film "Nebraska" and his highly anticipated new film "Downsizing," It also features the addition of a Discussion Guide with Index. 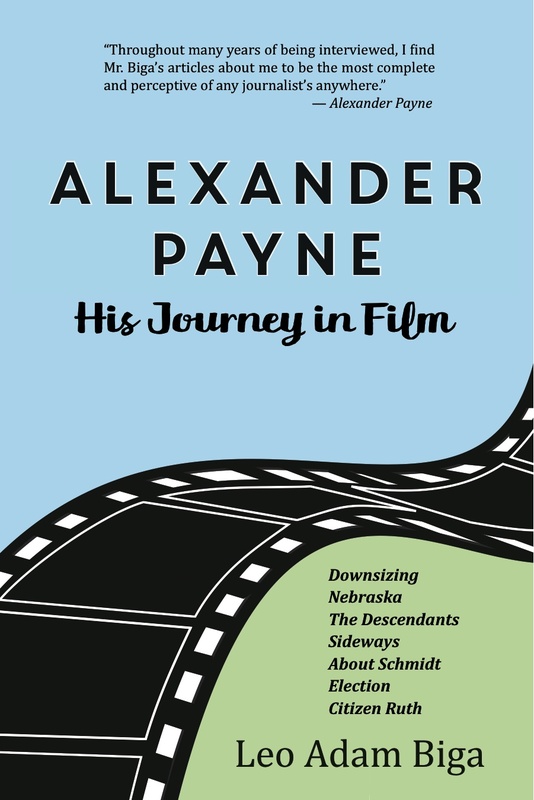 Payne fans will appreciate the extensive interviews-stories that follow the arc of the writer-director's career from brash upstart to consummate filmmaker at the head of the Indiewood movement. In covering Alexander Payne more than a decade and a half I accumulated a large body of work about someone I saw go from a promising newcomer few heard of and whose first two films were not much seen to an accomplished filmmaker recognized around the world. 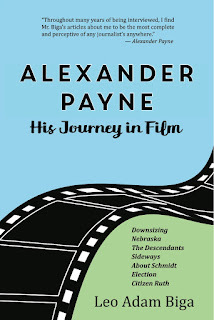 The book collects my journalism about Payne and his journey in film, thereby preserving my work about him in an enduring, hard-bound fashion and thereby contributing my take on this important film artist. Even though Alexander Payne demonstrates time and again that commercial considerations mean very little to him, following the breakaway success of The Descendants (2011) there was every reasonable expectation he might lean a bit more again in the direction of mainstream with his next film. I say again because I count The Descendants as a conventional, even mainstream work even though its protagonist rails against his comatose wife and sets out to wreck the life of the man she was cheating with, all the while trying not to lose it with his two grieving daughters in tow. Payne soon quashed any notion of playing it safe when he announced the small, insular back roads comedy-drama Nebraska (2013) as his new feature project. It did not help its bottom line chances that the film is set in rural Nebraska, which for most filmgoers may as well be the dark side of the moon for its unfamiliarity, remoteness, and perceived barrenness. Indeed, if Nebraska conjures any image at all it is of endless cornfields, cows, and monotonously flat, uninspired scenery. When the story laid over such a setting features a confused, depressed old cuss alienated from family and friends and wandering around in a bleak wasteland made even bleaker by black and white photography and desolate late fall, post-harvest locations, it does not exactly engender excitement. The prospect of a dour, feel-bad experience devoid of life and color does not get tongues a-wagging to generate the all important buzz that sells tickets. Of course, anyone who has seen Nebraska knows the film is not the downer it may appear to be from glimpsing a thirty second trailer or hearing a thirty second sound bite, but that it is ultimately a sweet, deeply affecting film filled with familiar truths amid its very Nebraskaesque yet also quite universal archetypes. Payne’s insistence on shooting in black and white was a completely legitimate aesthetic choice given the storyline and tone of this stark, autumnal mood piece about an old man having his last hurrah. But it also meant a definite disadvantage in appealing to average or general movie fans, many of whom automatically pass on any non-color film. Compounding the aversion that many moviegoers have with black and white is the fact that most studio executives, distributors, and theater bookers share this aversion, not on aesthetic grounds, but based on the long-held, much repeated argument that black and white films fare poorly at the box office. Of course, there is a self- fulfilling prophecy at work here that starts with studio resistance and reluctance to greenlight black and white features and even when a studio does approve the rare black and white entry executives seem to half-heartedly market and release these pics. It is almost as if the bean counters are out to perversely prove a point, even at the risk of injuring the chances of one of their own pictures at finding a sizable audience. Then when the picture lags, it gives the powerbrokers the platform to say, I told you so. No wonder then – and this is assuming the argument is true – most black and white flicks don’t perform well compared with their color counterparts. Except, how does one arrive at anything like a fair comparison of films based on color versus black and white? Even if the films under review are of the same genre and released in the same period, each is individually, intrinsically its own experience and any comparison inevitably ends up being a futile apples and oranges debate. Besides, there are exceptions to the supposed rule that all black and white films struggle. From the 1970s on The Last Picture Show, Paper Moon, Young Frankenstein, Manhattan, Raging Bull, Schindler’s List, Ed Wood, and The Artist are among the black and white films to have found wide success. It is admittedly a short list but it does prove black and white need not be a death sentence. To no one’s surprise Paramount did what practically any studio would have done in the same situation, which was to fight Payne on the black and white decision. In no uncertain terms Payne wanted to make Nebraska in black and white and just as adamantly the studio wanted no part of it. He pushed and they pushed back. He would not compromise his vision because from the moment he first read Bob Nelson’s screenplay he clearly saw in his mind’s eye the world of this story play out in in shades of black and white. It just fit. It fit the characters and the settings and the emotions and as far as he was concerned that was that. No questions asked. No concessions made. At any given time there are interesting journalism and other narrative-based projects that arise. Much of my work as a journalist entails writing about various arts-culture subjects. I also write a fair amount on social justice issues. On occasion I travel for my work. I once went to North Dakota to research a set of stories about a campus serving developmentally disabled individuals. I participated in a baseball tour of the Midwest that resulted in a first-person story I wrote about the tour group’s visits to various baseball shrines and stadiums in a five-state region. I spent a week on the set of Alexander Payne’s Sideways in the Santa Barbara region and wrote a series of stories from that experience. I traveled with a group of folks from Omaha to the first Obama inauguration in D.C. and filed a story about that. I have been out to Los Angeles a number of times related to my reporting on Payne and his films. In 2015 I received a grant for international journalism that funded my reporting mission to Uganda and Rwanda, Africa with world boxing champion Terence Crawford. This past summer I made my first visits to the American South and I wrote a number of posts about the experiences on my blog and Facebook page. In 2017 I hope to travel to New York or Toronto for the North American premiere of Payne’s new film Downsizing starring Matt Damon. I suppose I began thinking that way in college, though I didn’t do all that much writing then. it really wasn’t until some years after college, having worked in public relations and then beginning to freelance as a journalist, that I identified as a writer. But it still took me a few years to say the words “I am a writer” without stumbling over them. Yes, I do write full-time. Like most writers, much of my time is not taken up with writing per se, but rather with the different things that prepare me to write (interviews, research) and sustain my writing (pitching, marketing). There’s a fair amount of correspondence and phone conversation that takes place between myself and editors. My writing schedule depends on what else I have going on in terms of interviews and such. It also depends on what kind of writing I’m doing . If it’s a book, I try to plan writing on certain days and even during certain times of the day when I know I’ll be able to devote some undivided attention to the project. If it’s an article, then it’s a bit more haphazard and directed in part by deadlines. If it’s a blog or Facebook post, then it’s much more in the moment and as the spirit moves me. With any of these forms of writing though, I might be at the keyboard in the morning, afternoon or evening. As a nonfiction writer I depend on primary interviews for my source material and I am a stickler for recording all my interviews and transcribing them myself. I don’t recall ever really thinking in those terms as a child. I am also sure I would never have considered being a writer if not for some teachers in elementary and high school who encouraged me. There were a couple professors in college who also influenced me to follow this path. Most of my original writing these days is actually done for my blog and Facebook page. But those sites also serve as an archive and new platform for my previously published work. If your readers want a real sense for who I am as a person and as a writer, I encourage them to visit those sites. Thank you for being here today, Leo. Fantasy author D.C. Fergerson is here today and we’re chatting about his fantasy comedy novel, The Singer and the Charlatan. During his virtual book tour, D.C. will be awarding a $25 Amazon or Barnes and Noble (winner’s choice) gift card to a lucky randomly drawn winner. To be entered for a chance to win, use the form below. To increase your chances of winning, feel free to visit his other tour stops and enter there, too! D.C. Fergerson is an author, husband, father of one, humorist, and storyteller currently residing in Charlotte, NC. From an early age, through the fog and confusion of adolescence and early adulthood, the only thing he wanted was to tell stories. The Singer and the Charlatan is a fantasy comedy. In a land where magic is commonplace, all Leanna Moonbody wants to do is become a famous singer and play at the Saul Amphitheater. She meets a priestess named Trixi who has had a vision of amassing a flock to take on a pilgrimage to the fabled Magic City, but doesn’t know where to start. She decides to team up with Leanna, so the singer can set up the crowds, and Trixi can bring them to ‘Our Lord’. I felt this book fits in a funny space. Fantasy is normally very highbrow and lofty, where this is lighthearted and doesn’t mind poking fun at its own genre. We don’t have much in the way of a Hitchhiker’s Guide to the Galaxy in fantasy, and I wanted to do something like that. I wanted to bring a deep and expansive fantasy world with a rich history, and insert absurdity and chaos. Well, book two, The Princess and the Holy Juggernaut should be out late February/early March. While I’m crafting book three, I’ll be releasing what I’m calling an ‘anti-romance’ novel later this year called Horses on the Wind. I honestly believed this story couldn’t be told. I’ve been a tabletop roleplayer most of my adult life, and out of every story and campaign, this one seemed impossible. The story is chaotic, the characters have these over-the-top personalities, and Trixi’s religion is alien and has so many rules to it for how absurd it is. I originally wrote this as a challenge exercise of ‘this is how I’d write it if I was going to’. One week and 250 pages later, I had The Singer and the Charlatan and a chunk of the next book, which I wrapped over the following month or two. With The Singer and the Charlatan, I knew the story from already playing it, so I just sat down and wrote it. Normally, I like to be a little more organized ahead of time. Both book three and Horses on the Wind, I did my research ahead of my outline. My kitchen table serves as my office in the wee hours of the night. The struggle of living in a tiny house is real. I’m a drooling fanboy for Chuck Palahniuk. I love his work. A lot of modern writers just don’t impress me, so I read a lot of early 20th century classics. I love Tennessee Williams, J.D. Salinger’s A Catcher in the Rye is probably one of my all-time favorites, John Steinbeck. I also have a thing for stage plays of that era, I just eat them up. My writing style is very dialogue-centric as a result. I love banter and the feeling of peeking in on a real, organic conversation. 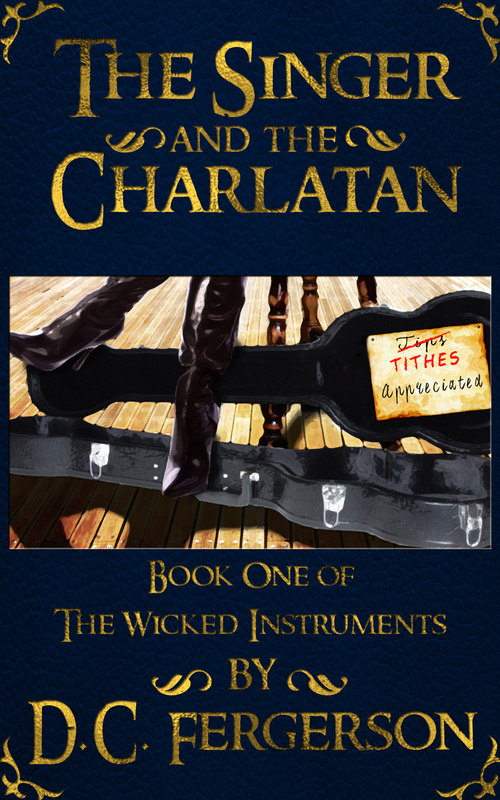 Book two and three of The Wicked Instruments are coming this year, so make sure to pick up The Singer and the Charlatan in e-book or paperback and please leave a review. I love reviews. Thank you for being here today, D.C.
Mystery author Chelsea Quinn Yarbro joins me today and we’re chatting about the newest novel in her historical mystery series, Living Spectres. A professional writer for 49 years, Chelsea Quinn Yarbro has sold over ninety books, more than eighty works of short fiction, and more than three dozen essays, introductions, and reviews. She also composes serious music. Her first professional writing - in 1961-1962 - was as a playwright for a now long-defunct children's theater company. By the mid-60s she had switched to writing stories and hasn't stopped yet. After leaving college in 1963 and until she became a full-time writer in 1970, she worked as a demographic cartographer, and still often drafts maps for her books, and occasionally for the books of other writers. She has a large reference library with books on a wide range of subjects, everything from food and fashion to weapons and trade routes to religion and law. She is constantly adding to it as part of her on-going fascination with history and culture; she reads incessantly, searching for interesting people and places that might provide fodder for stories. In 1997 the Transylvanian Society of Dracula bestowed a literary knighthood on Yarbro, and in 2003 the World Horror Association presented her with a Grand Master award. 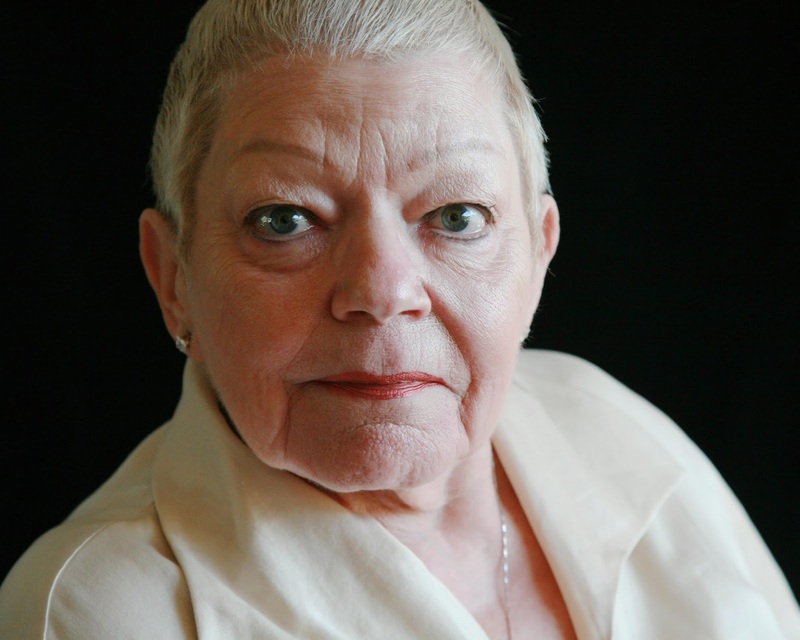 In 2006 the International Horror Guild enrolled her among their Living Legends, the first woman to be so honored; the Horror Writers Association gave her a Life Achievement Award in 2009. In 2014 she won a Life Achievement Award from the World Fantasy Convention. A skeptical occultist for forty years, she has studied everything from alchemy to zoomancy, and in the late 1970s worked occasionally as a professional tarot card reader and palmist at the Magic Cellar in San Francisco. She has two domestic accomplishments: she is a good cook and an experienced seamstress. The rest is catch-as-catch-can. Divorced, she lives in the San Francisco Bay Area - with two cats: the irrepressible Butterscotch and Crumpet, the Gang of Two. When not busy writing, she enjoys the symphony or opera. Welcome, Chelsea. Please tell us about your current release. 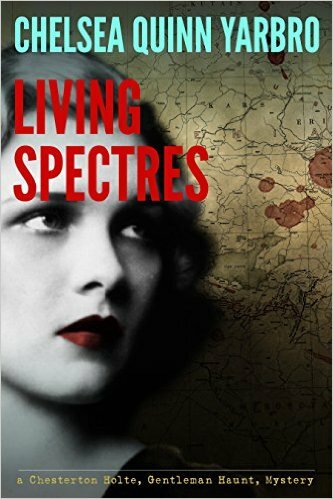 Living Spectres is the second novel in my Chesterton Holte series. It takes place in Philadelphia in early September, 1924; Poppea Millicent "Poppy" Thornton is still covering the crime desk at the Philadelphia Clarion, following up her investigation of the murders of Madison Moncrief and Percy Knott, which revealed a smuggling and Customs fraud ring with ties to Poppy's cousin Stacy, now on the run from the authorities. With help from Chesterton Holte, the ghost of a Canadian history teacher who spied for England in Europe during WWI, and was inadvertently responsible for Poppy's father's death, Poppy is able to pursue leads among the ghosts of the various victims of the case she is investigating. In addition to the smuggling and Customs fraud case, Poppy is called upon to help in locating GAD Pearse, the heir to the Pearse fortune, who is missing in eastern Europe. Holte uses his contacts in the dimension of ghosts to track GAD Pearse, and Poppy is able to assist Inspector J. B. Loring in finding him, as well as supplying information regarding her continuing case. I liked the characters, and it's what I do for a living. I've turned in Chesterton Holte #3, Shining Phantoms, and am about to start work on #4, Chasing Ghosts, my 96th sold book. In addition, I've been working on some short fiction as well as the next Saint-Germain novel, Orphans of Memory. I wrote my first story when I was six, and knew then I wanted to be a writer. When I sold my first short story in 1968, I felt I had earned the name as a professional. I get up around 7:30, feed my two cats, Butterscotch and Crumpet, take a bath, and around 8 or 8:30 go into my office and devote an hour to email and similar sorts of business matters. Then I get down to my writing work. I stop for lunch between noon and 2pm, and go back to work around an hour after lunch. I stop work around 4 and watch the news and feed the cats. Toward the end of a book, I go back to work from about 8 until 10, and try to be in bed by 11. I do this 6 days a week except when I'm traveling or have house guests. What do you do other than write? These days I concentrate on my writing, but I do like attending the opera and symphony, and seeing an occasional movie. I read a lot, and often watch TV in the evening. And I spend time with my friends --- I have the best friends in the world. Before arthritis caught up with me, I rode horseback regularly; I still compose music occasionally and recently I've attended occasional rehearsals of a couple plays I've written for a Holmesian group in Jackson, CA. Probably my love of semi-colons. I wanted to be a writer. This is one of those "beware of you desires for surely you shall achieve them" situations. I've been in the business for 49 years and I have not seen the print-and-paper publishing industry as difficult as it has been for almost a decade; so do not lose faith in your own work --- but realize that right now, it's hard for almost all writers, and this is not likely to change any time soon. Thank you for chatting with me today, Chelsea! My special guest today is writer Leona Evans. 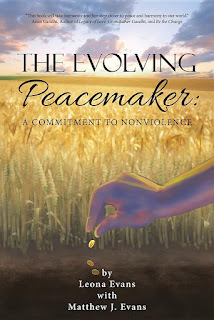 We are talking about the non-fiction self-help book, The Evolving Peacemaker: A Commitment to Nonviolence she co-wrote with her son Matthew J. Evans. 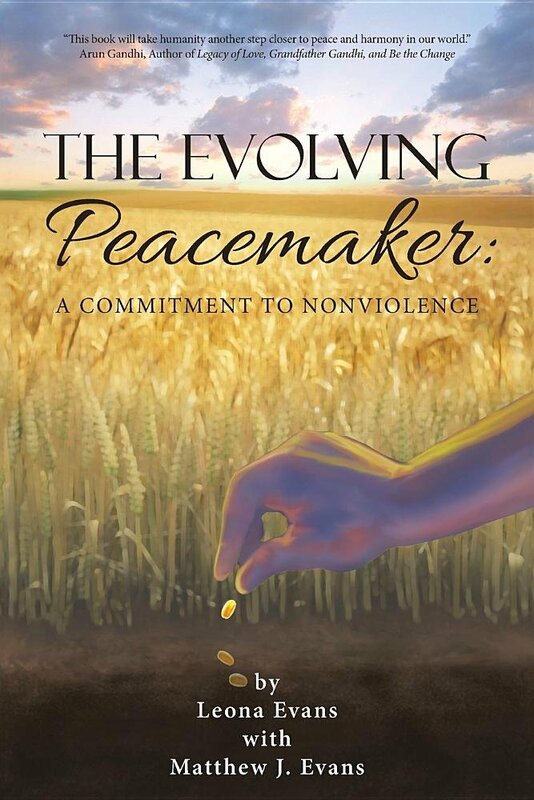 Leona Evans is the author of The Evolving Peacemaker: A Commitment to Nonviolence. She holds a Master of Arts in Religious Studies and is an ordained Unity Minister, spiritual counselor, and former Chair of the Metaphysics Department at Unity School for Religious Studies. She is the co-author, with Carol Keefer, of two books: Nothing Is Too Good to Be True! which was also translated and published in Russia, and Spirituality & Self-Esteem. In addition, she co-authored and narrated a two-CD set, Meditations for Transformation: Awakening the Soul through the Enneagram. 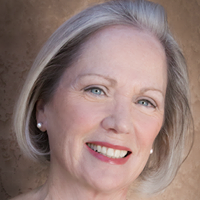 Ordained in 1985, Evans has been the minister at Unity of San Luis Obispo, California, for the past twenty-two years, during which time she has taught numerous classes on the power of the mind to shape our destiny. Leona is an accomplished speaker and teacher, and her positive messages have been heard on radio and television stations throughout the world. She is a former Broadway actress, recording artist, and cabaret performer, whose theatrical career of more than thirty years began when she was a small child. Eventually she was guided to study world religions and chose the ministry as a way of helping people understand that nonviolence among religions begins with the realization that the same God of love indwells all people. Evans is the proud mother of musician, filmmaker, and actor Matthew J. Evans, whose rich contributions to this volume have added “author” to his considerable list of accomplishments. Leona is available to present her workshops and seminars at business conferences, spiritual centers, and educational venues. An accomplished actor, musician, and award-winning young filmmaker, Matthew J. Evans was born in 1996 and is a native of San Luis Obispo, California. He played a feature role in Columbia Pictures’ comedy Bad Teacher, for which he received a 2012 Young Artist Award in Los Angeles. A frequent guest star on a number of network television shows, Matthew appeared on the Disney XD series Lab Rats in 2014, for which he won another Young Artist Award. In 2015, he played a dramatic role in the feature film Dismissed. A professional musician, Matthew sings and plays double bass, acoustic guitar, and bass guitar. He is also a documentary filmmaker whose mission is to produce movies and videos that entertain, educate, and inspire audiences to find value and meaning in their lives and in the world. In 2010, Matthew produced and directed a short film called A War Story, A Love Story, which won Best Documentary and Best in Festival at Interlochen Future of Cinema International Film Festival. In 2011, Matthew produced and directed a documentary short film called Poetic Justice Project, which won Best Student Documentary at the Spirit Quest Film Festival in Pennsylvania, Best Young Filmmaker Documentary Short at the Red Rock Film Festival in Utah, and, in 2014, the Gold Jury Prize at the Social Justice Film Festival, Youth Visions Competition in Seattle. In 2012, Matthew produced and directed a documentary short film called A Quest for Peace: Nonviolence Among Religions, featuring interviews with Arun Gandhi, grandson of Mahatma Gandhi. During 2013–14, the film won awards at nineteen film festivals throughout the country. A highlight of Matthew’s filmmaking career was receiving the first Teen Art of Making Peace Award in September 2014 from the Peace in the Streets Global Film Festival, presented to him at the United Nations third High Level Forum on a Culture of Peace by Former Under- Secretary-General Anwarul Chowdhury. Welcome, Leona. Please tell us about your current release. The Evolving Peacemaker, based on the Gandhi philosophy of nonviolence, contains a set of principles and practices designed to guide the reader on a powerful journey of self-discovery and enlightenment. It opens with the premise that peace is not a one-time achievement but a lifelong practice that starts with our willingness to “be the change we wish to see in our world,” one thought and one action at a time. In these troubled times people are seeking hope for our future – ways to communicate with one another in healthier, more effective ways. As a Unity Minister for the past 30 years, I have taught that real peace begins within our own consciousness. Recently, I began to question how I could frame this message in a way that would make a powerful and positive impact on a wider audience. Four years ago my son, Matthew J. Evans and I had the honor of spending time with Arun Gandhi, grandson of Mahatma Gandhi. We engaged in several meaningful discussions on the Gandhi teachings of nonviolence. These meetings resulted in Arun’s participation in an award-winning documentary short film which Matthew produced called “A Quest for Peace: Nonviolence Among Religions.” After earning numerous awards at film festivals throughout the country, Matthew received the Teen Art of Making Peace Award at the United Nations third High Level Forum on a Culture of Peace. Inspired by this event I began studying the Gandhi teachings in greater depth and concluded that his philosophy of nonviolent action is more relevant today than ever. With valuable contributions from Matthew and a foreword by Arun Gandhi, I wrote this book hoping to help people understand that nonviolence is more than a method of conflict resolution – it is a way of life. There is hope for our future. “From the great pyramids to walking on the moon to finding cures for diseases using advanced technology, humanity has proven, time and again, to possess an unwavering tenacity and a potential for greatness that goes beyond anything we could possibly imagine. No matter how hopeless the circumstances might seem, humanity has always prevailed and risen above adversity. Before I make that decision I would like to hear feedback from readers and see which concepts from The Evolving Peacemaker could benefit from further discussion. The topic of nonviolence is a passion for both Matthew and me. As peace activists we plan on delving deeper into these ideas. I’ve been writing since 1986. My first book, co-authored with the late Carol Keefer, is called Nothing Is Too Good To Be True! It was translated and published in Russia, where I spent several months teaching these ideas of personal transformation in St. Petersburg and Moscow. My second book, called Spirituality and Self-Esteem, was published in 2000. A chapter was published in the new millennium edition of Unity Magazine and I taught workshops and classes using concepts from the book. I am not a full-time writer. I have served as minister at Unity of San Luis Obispo for the past 22 years. I am motivated to write a book only when I feel passionate about the subject matter. For the most part I teach classes, conduct Sunday services, and recently have become an Action Team Leader for the Peace Alliance, a national organization which promotes nonviolence. My best hours for writing are between midnight and 4am. I have always felt more focused and productive during those times. I would love to be more creative during daylight hours, but so far that has not been the case. When I was a child I wanted to be an actress. I began working in the theater when I was four years old and continued to work in musical theater and cabarets for the next 25 years. My son, Matthew, also began working in the theater when he was four years old and switched to television and film at the age of nine. The Evolving Peacemaker is not only the title of a book, it is a state of mind – a way of life. The cover of our book shows a person planting a seed in a wheat field. Every great idea begins as a seed. Moving from a culture of violence to a culture of peace is not something that is accomplished overnight or even in a lifetime. However, as Gandhi has stated, each act of compassion, no matter how small, plants a seed that blesses the planet. May the words in this book plant seeds that inspire all who read it. Thank you for stopping by today, Leona.